Well, I am once again late in this monthly update... and on the last one of his year! I guess this will be the challenge of having a December 1 bday in the family- making special time for bday celebrating amidst all the holiday festivities! I am also prepping for a parent's getaway- Larry & I leave in 3 days, and won't be back till the 23rd- which also means I must have all Christmas shopping, wrapping, etc done before we go! Whew! ~We went to your 12-mo check up last week and you're a healthy boy! Thank goodness, b/c I was afraid you still had an ear infection- you've been fussy, waking up at night, etc. But apparently that is just related to the 3 teeth you've had coming in, top 2 middle and bottom right. And all of your mobility has leaned you up- you were a surprising 27% in weight at 21lbs 5oz and 84% in height at 31inches. We've always thought of you as our "big boy", but now you're tall & lean like your sister! ~You continue to be super-busy with walking, running, climbing... yesterday you climbed up on the couch by yourself! You like to climb the stairs, and up onto the low armchairs in the kitchen to drink your milk there like a big boy. ~Although you're a great eater, you have not yet become a fan of solids. You'll eat dry cereal, crackers & cookies, but not many other finger foods. The doc said it's time to start pushing you towards "real" food, and I know you'll catch on. I'm confident you won't go to kindergarten with baby food in your lunchbox! ~On your bday you had to have your first time-out and it's a story worth telling. I had taken a book from you that you were eating, and you threw a royal fit b/c of it. When you throw a fit you put your head face-down on the ground and YELL. You wouldn't settle down so I asked daddy if we should just put you in time-out in your crib. He took you to your room and put you down- that made you even madder! Every few minutes or so he'd go in to see if you were done- you'd angrily push his hand away or throw something across your crib- you really know how to throw a fit! Finally, after about 15 mins of solid screaming, you stopped. Daddy went in to check on you, and you looked up at him and did the sign for 'all done', as if to say, "I give in daddy. I'm all done now!" He asked, all done, and you signed it again! So daddy got you up, trying not to laugh at you! ~You love to "brush" your hair -and teeth!- with my hairbrush, play in shower, whether it's on or off, and, since your bday, ride in the back of and play with your big dump truck! You still love to run after Georgia and she's taught you to screech loudly as you run. You yell and push her if she takes your toy,which is often, or grab her shirt and pull her down. But, the majority of the time, you play nice together! ~Although you're still not saying many words, you continue to improve on the sounds you make. A few words you do say- uh-oh, calling daddy dada instead of just saying it randomly, calling Georgia gaga, and you love to give big hugs at our knees! 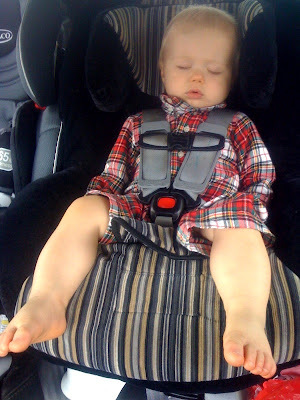 ~Your 12-month status has earned you a few "big boy" privileges: you moved up to the bigger car seat and are now forward-facing, making everyone in the car happier. You are drinking whole milk now, no more formula!, and will sometimes drink it out of your sippy cup. ~You have definitely become a "mommas-boy" lately. I don't know if you just need extra comfort from those sharp little teeth making their way thru, from your ear infection over Thanksgiving, or if you just can't get enough of me- it is both flattering and, well, annoying! I love it when you bury your head shyly into my shoulder, but can't stand how you hang on my leg screaming when I need to fix dinner! I try to remind myself you won't "need" me forever and try to balance pushing you towards independence and smothering you with kisses! As I look back on your first year, I feel so blessed to get to be your mom. You are such a sweet, happy, snuggly boy! I am ever-grateful to the Lord for your health, your growth, for the love He shows me thru you. The first year is full of so many new discoveries, learning moments, special times and even a few struggles- we have loved doing all of this with you! Your daddy & I both continue to seek God's direction in our parenting and will love you more each day!